(Vs. 11) “Then I saw another beast rising out of the earth. This second ‘beast’ arises out of the earth. It is a resurrected empire, namely the first one but resurrected. It is arising out of the earth where it had been buried for a time. John tells us that this beast empire that he sees, once was, now is not, and will come up out of the Abyss and go to his destruction. (Revelation 17:8a) this is the Empire of Islam; “the beast wounded by the sword and yet lives.” It is an empire with occult power and its leader the antichrist indwelt by Satan himself. (Revelation 17:8) Satan has resurrected this empire in the last days. It will astonish people on the earth because it has reappeared on earth and has great power. (Revelation 17:8a) We need to keep in mind that when John sees these things that he is out of time as we know it here on earth and he is seeing into the past, the present and into the future and the events are all running together and related to each other. We are told that the seven heads are seven hills or mountains on which the woman (harlot) sits and that they are also seven kings. We are told that five have fallen, one is, the other has not yet come, but when he does he must remain for a little while. Now we are told that the beast empire is an eighth king who belongs to the seven and is going to his destruction. (17:9-11) this eighth king is the empire of the Antichrist. The seven hills upon which the harlot sits is a city. As we have seen in the previous study the woman or prostitute is the City of Babylon in a desert by the Red Sea that is drunk with the blood of the saints and that is Mecca which is surrounded by seven literal mountains. Over the centuries Islam has murdered untold millions of Christians. Back in 2013 a nun in Germany did a presentation in a conference of an independent investigation she conducted of the treatment of Christians in Syria under the hands of Muslim fundamentalists. She revealed that Muslims were butchering Christians, draining their blood in bottles, and selling each bottle for $100,000 to Muslims in Saudi Arabia who took it to wash their hands in Christian blood, with the belief that it would atone for their sins. Islam indeed is “drunk with the blood of the saints.” (Revelation 17:6) Mecca and the Saudis are called a harlot because she is the source of all false religions because her roots go back to the Babylon of Nimrod the original source of all of the false religions in the world. She sits on many waters as she trades by sea with many nations. (Revelation 17:2) she is richly adorned with opulence unmatched anywhere else in the world. She is an integral part of the seven heads and the ten horns because the seven heads or mountains we are told are also seven kings. The Seven Hills also represent seven kings. Whenever we see a reference to “the Lamb” in the book of Revelation it refers to the Lord Jesus the Messiah and the Lamb of God “that takes away the sin of the world” and the one “who was slain from before the foundation of the world.” This Second Beast Empire has two horns like a lamb, but spoke like a dragon. Rather than apply it to a false religious leader or super Church or even to two countries like England and America, both Christian countries, it should really apply to two Islamic leaders that are past masters of Taqiyya, the Islamic art of lying in a time of Jihad and approved by Allah their god. There are two nations today that are good at playing Taqiyya. These nations are Turkey and Iran and they are Islamic fundamentalist nations both with the same agenda namely a global caliphate. Erdogan of Turkey has positioned himself as a Middle-East diplomat and peace-maker and has visited well over two thirds of the countries in the world including western democracies and not only in the Middle-East but In the South Pacific region especially Indonesia just North of Australia. Around 62% of the world’s Muslims live in the Asia-Pacific region (from Turkey to Indonesia), with over 1 billion adherents. The largest Muslim population in a country is in Indonesia, a nation home to 12.7% of the world’s Muslims, followed by Pakistan (11.0%), and India (10.9%). There is no doubt that through immigration and refuges pouring in from Islamic countries into the western democracies that Islam is building a Trojan horse right at the very heart and core of western democracy and civilization. There is no doubt Erdogan of Turkey is gathering supporters for his revived Turkish Ottoman Empire with himself as its supreme caliph. When he speaks it is with the voice of a dragon. Rouhani of Iran is the same way. As they say “birds of a feather flock together.” However, they can smile and play well on the field of political correctness and can wheel and deal with western politicians through money and oil but it is clear that their intent is to destroy Israel, destroy western democracy and establish global Sharia Law. How Obama could even have dealt with Iran when he was in office defies imagination when Iran, a sworn enemy of Israel and America, has publically stated its distain for America and its hate of Israel and a regime that openly persecutes Christians. It is written in the prophet Daniel that the Antichrist “by peace will destroy many.” (Daniel 8:25) (KJV) When you watch the old film footage of Adolph Hitler speaking at these Nazi rallies his words excited the masses, young people were mesmerised by his rhetoric. Young women and teenage girls adored him and with adulation in their hearts hung on every word he spoke yet the man spoke like a dragon! If you listen to his speeches his words were filled with hate and anger and malice and a virulent hatred of Israel with the deadly intension of destroying everything that stood in the path of making a 1,000 year Reich. When the Mahdi of Islam or the Caliph arrives on the world stage things will change across the whole Muslim world. Once he has consolidated his power, by satanic stealth, he will openly call for a global Jihad for Islam and then 200 million tanks armed with high powered missiles will embark across the dried up Euphrates River in a Jihad like nothing else has ever occurred in previous history and take out a third of mankind by the firepower they have. (Revelation 9:17-19) Once the Caliph or Mahdi has achieved a ‘peace’ of sorts he will show his true colours when he has the advantage or the upper hand. This is the way of Islam in politics. This is the way of Jihad. There is no philosophical or peaceful Islam there is only Islam! What else do we discover about this Second Beast Empire? (Vs.12) “It exercises all the authority of the first beast in its presence, and makes the earth and its inhabitants worship the first beast, whose mortal wound was healed. If it is Iran that takes out Mecca either with missiles or with a nuclear device, the black stone will be gone and millions of Muslims will find themselves in a mental, emotional and spiritual vacuum because they will have nothing left to worship, no image of their god to venerate. Because of this vacuum they will look for their Mahdi and someone or something to worship seeing they can no longer pray towards Mecca because it is gone. Into the vacuum will step the Mahdi of Islam and the whole Muslim world will follow him. All around the world Muslims will worship and venerate him as the incarnation of the prophet Mohammad. His burning ambition of course will be to be worshipped on the Temple Mount in Jerusalem as God. No wonder Erdogan of Turkey wants to build a Turkish Embassy in east Jerusalem. He would have access to the Temple Mount. As we have already discussed in the previous study when you read a statement such as “and makes the earth and its inhabitants worship the first beast” it is not the entire globe but wherever Islam has been established. It will not be a global empire in that there will be nations that will fight Islam as there has been in the past. (Micah 5:5-6) (Isaiah 14:9-17) God has never allowed any man to have entire control over the whole globe. Satan is already the god of this world. He wants to be worshipped as god and will succeed through the Antichrist but it will not be the whole globe but only in the world where Islam has been established. Now there are three things that will be used to get people to worship the caliph or Mahdi and the ideology that is Islam. These are stated as great signs, even making fire come down from heaven, an image of the beast empire and a mark on the right hand or the forehead without which no one will be able to buy or sell within the domain of his empire. Now let’s look at these three things. Ultimately all three most likely will be in the area of technology. Western technology itself is no longer restricted to America or Europe but is a global reality today. Islamic terrorists are using it. Technology in itself can be a valuable tool but in the wrong hands it can be devastating to say the least. Is it possible that in the future you will see a blending of Islamic ideology with western technology? Today the image of the beast empire of Islam is the Koran. Its message is broadcast from minarets over loudspeakers calling Muslims to prayer and Islam itself is being propagated through the television and the internet. It is the age of technology and Muslims are not backward in making inroads into technology. The word for ‘image’ in the Greek text is the word ‘icon.’ Usually it is associated with religion. In the Greek Orthodox Church tradition they have ‘icons’ or pictures of saints to whom they pray. These icons are for them a mirror into the spirit world. Television and the Internet are also ‘mirrors’ into the spirit world in that the images they project go down on the inside of a person to affect the imagination. When Hitler was in power in Germany he used the media such as radio broadcasts and movie films to indoctrinate the masses and it succeeded. Islam is now doing the same thing and through the television and the internet the Koran and Islamic ideology is being fed into the minds and the imaginations of Muslims around the world. There is a younger generation of Muslim fundamentalists that will have been indoctrinated and brain washed to be remorseless killers for Allah. Child training camps are operating around the globe. We have already seen ISIS recruiting through well produced video clips and images. Last year Erdogan of Turkey had an image of himself as a hologram speaking to a great auditorium of his followers in Turkey. Of course he was not physically present. All of the Islamic regimes are using this ‘image of the beast’ to affect the imaginations of millions of Muslims especially the next generation growing up. The day is coming when fielding an army of 200 million Muslims will not be a problem. This ‘mark’ is “in” the forehead or right hand and not on them. (KJV) In Islam they are big on taxes and have several forms of it. The main one they enforce on non-Muslims is the Jizya tax which was historically imposed on Jews, Christians and Zoroastrians in the Arabian peninsula, the Levant, Iraq, North Africa, Caucasus and Spain, and on Hindus on the Indian Subcontinent into the 19th century, but almost vanished during the 20th century. The tax is no longer imposed by nation states in the Islamic world, although there are reported cases of organizations such as the Pakistani Taliban and ISIS attempting to revive the practice. Having said this in the empire of the Antichrist this will be reintroduced with the intention of making non-Muslims become Muslims in the end. Today all over the Muslim world you see Muslims wearing a head band and an arm band on their right arm with the Islamic creed of faith printed on them. It is a ‘mark’ or ‘badge of servitude’ showing ones allegiance to the beast empire of Islam and submission to its ideology. We need to keep in mind that Islam is not merely a religion but a form of government and a socio-economic system and a militaristic power. Religion is a component of Islam. In the future it may be that there will be a microchip that will have on it the creed of Islam and that without it you will not be able to buy or sell anywhere in the Antichrist’s kingdom wherever it has established itself in the world. There will be Middle-eastern and European countries under Sharia law once the Antichrist has come to power. His empire will stretch across the Middle-East and into parts of Europe. He will be both a Middle-Eastern and a European Potentate. Ultimately everyone who resides in his empire will be forced to take his mark in the forehead or right hand if they want to buy and sell and worship him or face the only alternative to lose their heads. Worshipping the Beast will be worshipping the system of Antichrist and in submitting to his Koranic Sharia law will be an act of submission and worship. (Vs.18) “This calls for wisdom: let the one who has understanding calculate the number of the beast, for it is the number of a man, and his number is 666. Down through the history of the Church there have been those whose names numerically add up to 666 and were seen to be the Antichrist. However, in the Greek text it reads “for it is the number of man, not ‘a man.’ The number seven represents God in His perfection and completeness. The number 888 represents the Lord Jesus as His name adds up to the number 888.The number 666 represents fallen man in his spiritually unregenerate state and is less than the numbers 7 and 888. The number 666 represents the empire or kingdom and does not necessarily imply that this number will be a literal number on a microchip. Having said this we must not discount the reality of what we see happening in the world of Supermarkets, Banking and retailing where machines are taking over humans. Added to this the 666 numbers are hidden but on barcodes. Checkout personnel in Supermarkets and bank tellers are rapidly become things of the past. Some now have wristwatches with microchips in them that allow the wearer to shop, pay bills and do their banking all online. Most of us still use the card with the microchip. Now you just have to ‘tap’ your card on the scanner to make a transaction. With cards stolen, broken and fraudulently used by hackers you can well see that in the future putting a microchip in the forehead or right hand or arm will be the preferred option and that without it you will not be able to buy or sell. By that stage it will mean submission to the Antichrist beast system of government. The two ‘Beasts’ of Revelation Chapter thirteen represent the Resurrected Empire of Islam, namely the revived Turkish Ottoman Caliphate with a supreme Caliph who will also be known as the Mahdi. This first empire arises out of the Mediterranean Sea and is a Middle-eastern Empire, not a western one. The Second Beast is the resurrection of this same empire out of the earth or the grave as it were and it is occult to the core as it is a satanic resurrection. The two ‘horns’ kings or rulers most likely would be the Presidents of Turkey and Iran today. The second beast empire focuses on the resurrection of the beast empire of Islam and how the first beast empire will get people within the empire to worship the Koran and its teaching and the Islamic Antichrist himself, the supreme Caliph of Islam. Three things will be used to get people within the Kingdom of the Antichrist to bring people into the empire. Secondly; the image or ‘icon’ of Islam will see the message of the Koran and the veneration of the Caliph or Mahdi broadcast on television and on the internet. In Mosques packed to the rafters with Muslims you may well see a holographic image of the Caliph speaking to the Muslims (like you see in star wars) The ‘image’ that has ‘breath’ in it is the message of the Koran through television and the internet and in Mosques hitting the airwaves in the atmosphere, in that same domain where we are told that Satan resides. He is called “the prince of the power of the air” namely, the ‘air’ being that atmosphere just above the surface of the earth where the radio and television waves circumnavigate the globe. Through the media the image of the beast, the Koran and its leader will captivate the imagination of Muslims all around the world. Added to this there will be no Kaaba or black stone as they will have been burned with fire an no longer exist. Everyone within the boundary of the Mahdi’s empire will be forced to submit to Sharia law, submit to the Koran and confess openly the creed of Islam giving homage to its leader the caliph. Today western technology is embraced in Islam. As we have mentioned component of Islamic ideology is that is it a form of government and a socio-economic system. Buying and selling are subject to allegiance to Islamic Koranic law. In times past when Islam was previously in its heyday a tax was levied on all non-Muslims. In the revived empire of Islam this tax will be enforced in view of seeing non-Muslims become Muslims. Ultimately those within the Islamic empire who do not submit to Islam and Koranic law and to the Caliph will be beheaded especially those who are believers in the Lord Jesus. In the days of the Roman Emperors those who refused to worship the emperor were crucified or thrown to the lions. In the days of the caliph of Islam those who refuse to venerate and worship him and will not submit to the creed of Islam and to the Koran will be beheaded and I dare say some will be crucified. Already we see this happening in all of those countries where the empire of Islam has spread. In Islamic countries we see the head band and the arm band being worn by many Muslims which have printed on them the creed of Islam. Through technology and the microchip people within this Islamic system of government would be able to be controlled and that without this Islamic microchip they will not be able to buy or sell anywhere within the empire. Ultimately the mark or microchip would have to be “in” the forehead or right hand. Microchips have the capacity to store a lot of information. Already in America they have developed microchips for those on parole which can pinpoint where they are anywhere in the world. Microchip technology is very active today in buying and selling and ultimately it will be used to track people and to keep ‘tabs’ on them. At present a divided Europe may seem ‘farfetched’ to many who are looking to Europe or even America for that matter to see a western Antichrist immerge. As to America most likely it will be one of the nations God will actually raise up to fight Islam and to “control the land of Nimrod with the sword, the drawn sword.” (Micah 5:6) Much of Europe will eventually become Islamic. The refugee invasion of Western European countries is the forerunner of the invasion of Europe by Islam. They will not get all of Europe as there will be European armies that will fight Islam as they have done in the past and most probably under the banner of the cross as they did in the crusades. In the future there will be a war between Islam and Christendom on European soil, a war between ‘the cross’ and ‘the crescent.’ History will repeat itself in this matter. Basically Western and Eastern Europe will be divided. Most probably there will be another ‘Crusade’ only this time it will be on European soil between the countries overrun by Islam and those countries keeping their Christian heritage and keeping Islam out of their countries. Eastern Europe, predominantly part of Institutionalised Christendom will resist Western Europe which will be predominantly Islamic. Already we see untold thousands of Islamic refuges pouring into Western Europe. Islam already has their ‘Trojan Horse’ on European soil. Time will tell if this scenario concerning Europe is right but the way things are going in Europe most likely these things will occur in the near future. The Antichrist will be both a Middle-eastern as well as a western European potentate. He will not arise in Europe but in the Middle-East but like Suleiman the Magnificent the Antichrist’s Turkish Ottoman Empire will expand into Europe. In the middle of revelation chapter thirteen John writes; “This calls for patient endurance and faithfulness on the part of the saints.” As believers we often face times of hardship and trial and tests in this life that call for patient endurance and faithfulness. We may just see our trials and tests as just a part and parcel of life and this is true but through these tests and trials God is preparing us as His people to have patient endurance and faithfulness to prepare us for the persecution that is coming to the western Church. Even though in the western democracies, for the most part, believers in the Lord Jesus do not face imprisonment or martyrdom for their faith things will change, especially in Western European countries traditionally associated with Christianity. In the western democracies, such as America and England and Australia, it is going to become increasingly more difficult to be a Bible believing Christian as we see laws being passed in parliament that will hinder the spread of Biblical Christianity in Australia. We also need to keep in mind that Islam is already entrenched in the South pacific region with Indonesia having the largest Muslim population in the world and located just north of Australia. When we see Daniel’s vision of Nebuchadnezzar’s statue we see all of the ancient empires connected to the head which was Babylon which traced its roots all the way back to the Babylon of Nimrod and the Tower of Babel. All world empires have their roots in Babylon and this includes this last beast empire of Islam. We see the statue but then we see the great rock, not carved out by human hands, roll down to smash the feet of the statue bringing all of it down together in one go and then that rock becoming a mountain (kingdom) filling the whole earth. 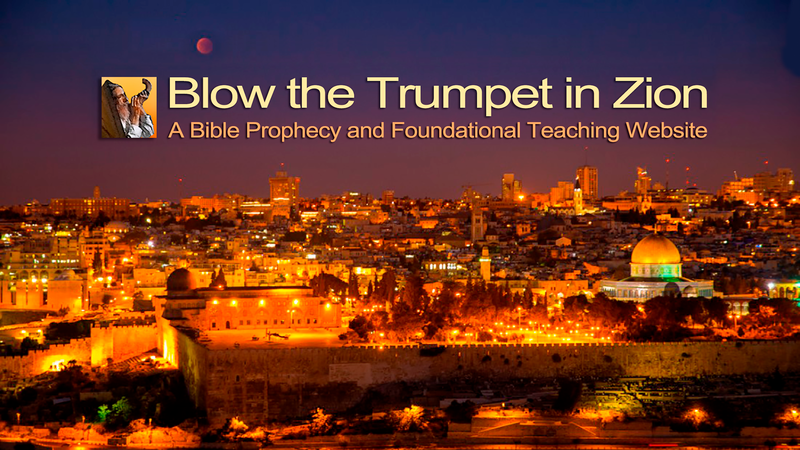 The Kingdom of the Messiah will overthrow the beast empire of Islam and it will be blown away. (Daniel 2:31-35, 44-45) There have been many beast empires in the past and many antichrists but they have all come and gone and it will be the same with this last resurrected Beast Empire. Our part in this whole end-time scenario is to be found patiently enduring and staying faithful to the Lord Jesus and to the Word of God in spite of the daily pressures that assail us at times from the world, the flesh and the devil. God will always strengthen us through adversity.